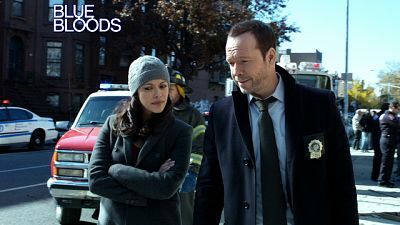 The “Blue Bloods” episode “Manhattan, Queens” in which Marc appears, in a scene with Donnie Wahlberg and Marisa Ramirez, is slated to air at 10pm EST January 31st, 2014 on CBS. Wahlberg is also directing the episode. Marc costars an NYPD sergeant who leads Wahlberg and Ramirez’s characters to a crime scene. The scene was filmed at an exterior location in Queens, NY during the height of the polar vortex’s bitter temperatures. Check out the episode details from CBS.